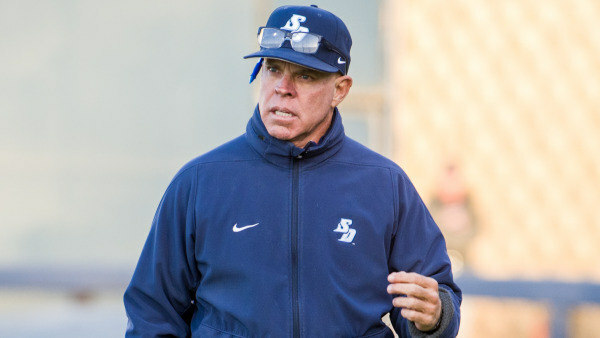 When freshman catcher Shane McGuire hit his walk-off home run Sunday, he didn’t just only give the Toreros the win against Gonzaga, he also gave USD baseball coach Rich Hill his 1,000th win. The game was sent into extra innings when Kevin Collard’s three-run homer in the bottom of the ninth that drove in Adam Kerne and Jeff Houghtby. McGuire’s dinger in the 11th was also the first for his college career, made the more special by helping Hill reached a milestone. Hill is now one of only 17 active college coaches to have at least 1,000 career wins. And Hills certainly has done that at USD. Under his tutelage, the Toreros have won seven West Coast Conference titles and had 80 players drafted and 85 signed professional contracts. He’s also had three-straight first-round draft picks from 2013 to 2015 — Kris Bryant, Conner Joe and Kyle Holder. After the win at Gonzaga on Sunday, Hill players gave him the characteristic Gatorade bath to mark the occasion. In addition to the win, that’s something he’s going to remember as well, Hill said.